As predicted, shares in the newly privatised Royal Mail spiked radically yesterday in early, conditional trading. Within hours, the value of the company had rocketed by almost 40% from the initial price of £3.3bn to £4.5bn. The way the sale has been managed by the government has caused outrage and scandal and the rampant profits raked in within minutes have raised accusations of ‘crony capitalism’. Applications to buy shares by small private investors could have bought the entire company and at least keep a former public service as ‘public’ as privatisation can be, with a broad spectrum of individual shareholders invested in the company. Instead, the government reserved 70% the shares for City funds and institutions. There is only really one conclusion to draw – that of an out and out stitch up. The first premise is fundamentally flawed – that City funds who are motivated purely by short term profit should trump small investors who could benefit modestly in a landscape where interest rates have rendered savings accounts next to pointless. Then consider the undervaluing of the company. One doesn’t even need to be much of a cynic to suspect that the cosy relationship between government and the City was behind this. In undervaluing the company so drastically, the government effectively gifted a 38% profit to the largest and most powerful City players. Who will no doubt repay the favour in due course. 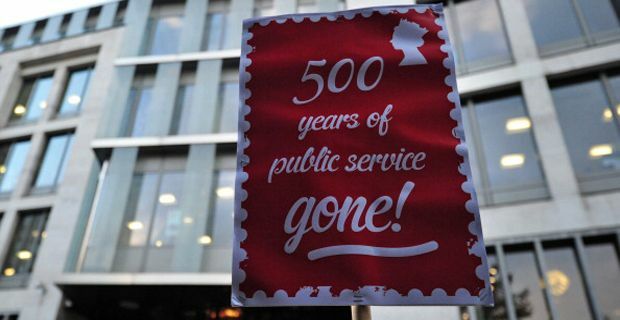 The Royal Mail has a vast property portfolio, so a good old fashioned asset strip seems inevitable, while jobs will be lost, services cut and prices forced up. The £1 stamp cannot be far behind. anywhere genuinely believe that privatisation will benefit the consumer or the public? It was anything but a drain on the taxpayer’s purse, but now, with City funds ruthlessly squeezing short term profits out of the flotation and private profits set to be built into the business model, we are once again seeing the public interest subsumed to the insidious nexus between government and the City. And yet knowing all of this, the people involved are still getting away with it? How broken does our society have to be when flagrant abuses like this can be carried out in broad daylight and with unquestioned immunity.